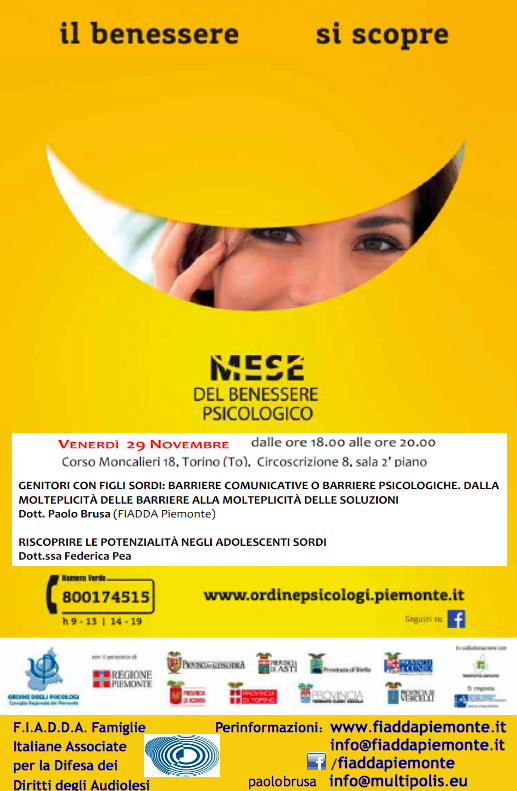 A double public event to deepen the issue of deafness and hearing impairment will take place in Turin on friday the 29th of November at 6 pm at the Centro Circoscrizionale, corso Moncalieri 18. The open event is part of the programme "Month of the Psychological Wellness" organised in collaboration with the Psychology Board of the Piedmont Region. The event is structured as an free seminar based on two speeches and a public debate on the issue of deafness. Both the speakers are interested personally by the dimension of deafness and hearing impaired. Paolo Brusa is a psychologist and parent of a deaf child; between his various activities, he collaborate as board member with Associazione Fiadda (Italian Associated Families to Defend the Rights of Deaf people), and offer his projects to overpass the communicative barriers and foster active inclusion programmes into school and educations. He also run group-work session addressed to persons parenting deaf children. Federica Pea is a deaf psychologist with a massive experience in supporting both deaf teenagers and their families; she is also a consultant for the town Juvenile Court, the Municipality, and a university researcher. To favour a clear communication, the direct traslation into sign language is available.